In a previous post I discussed how an important principle of adaptation was to remain faithful to the spirit of the original novel, rather than the letter. For this, I used The Remains of the Day as something of a case study. However, in this post I want to examine something a little more potentially controversial: how and when it is acceptable to only very, very loosely adapt a text, or even to reinvent it entirely. Such methods will inevitably cause controversy, and more often than not using a well established text as a basis for something completely different will only frustrate fans of the original work and fail to win over a new audience. However, there is one exception to this principle: if said “loose adaptation” is utterly brilliant in its own right, or even surpasses the original text, no-one will care. Examples of this principle include Alfred Hitchcock’s 1935 take on John Buchan’s The 39 Steps. There are many major, major changes to the plot, but the most potentially contentious addition is that of a romantic comedy subplot. However, it doesn’t matter because it all works brilliantly. The 39 Steps is justly one of Hitchcock’s greatest films, but if you haven’t, do check out the John Buchan original text. It’s a cracking read that stands up superbly in its own right. Other examples are found in the films of Dangerous Liaisons (1988), The Last of the Mohicans (1992) and The Iron Giant (1999). All of these drastically change or reinvent the text, but all three are brilliant and therefore rise above such criticism. The Iron Giant in particular is a truly radical departure from the Ted Hughes source material (his novel, The Iron Man). All that stuff about the Iron Man battling a hideous space creature the size of Australia was ditched. In fact, the only plot incident director Brad Bird kept in his film was the gigantic robot eating scrap metal as food. The underlying morality about pacifism does remain however. In fact, it is much stronger in the context of Cold War paranoia, which is why The Iron Giant is also an example of a film that is better than the book on which it is based. Perhaps the most famous example of novels that are loosely adapted is the James Bond series. Ian Fleming’s original books are massively altered both in terms of plot and character; mostly to brilliant effect, but occasionally to their detriment. 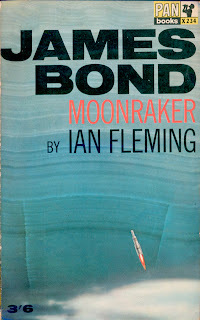 For example the Moonraker novel is completely different and vastly superior to the film version. Conversely, the only Bond film that sticks precisely to the book is On Her Majesty’s Secret Service – a much maligned film on release but posthumously recognised as one of the very best Bond movies. Both Moonraker and On Her Majesty’s Secret Service are examples of why it is sometimes best to stick to the original text. But the rest of the Bond series proves it is also possible to completely reinvent a novel into something different and brilliant in its own right.